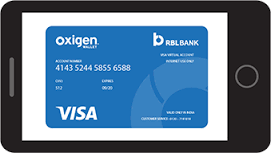 Oxigen, one of India’s oldest wallet payment system, said the load value on Oxigen Wallet prepaid visa cards have increased by 4 times in the last two days. It said people seem to be switching to prepaid cards to make payments in the wake of demonetization of high-denomination currency notes. “The daily average number of users have also increased by 167% which is clearly showing a trend that people are adopting new ways to make cashless transactions,” said Sunil Kulkarni, Deputy Managing Director, Oxigen Services India. Mobile Wallet app Oxigen Wallet which has over 25 Million users, launched Prepaid visa cards in February this year. It offers a Visa card number, complete with expiry and CVV details, to anyone who downloads the app. Since the card is linked to the balance on Oxigen’s wallet service, the risk of fraud is limited to the amount of money stored in the card. The prepaid visa card can be used to pay for all online transactions, but not for offline use. “This product allows consumers who do not have credit cards or wary of using their debit cards to make cashless transactions online. With these new developments, we foresee a further surge in adoption of Oxigen Wallet and Prepaid visa”, the company said.